Vapin had the most liked content! Replay will only work with temperature sensing wire, kanthal is not temp sensing. 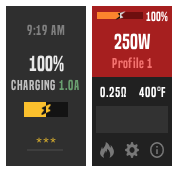 Throttling is when you hit Temp Protection on a DNA Color Chip, how is your Profile set up, are you using a Watt Profile or a TC Profile, what is your coil ohm, how many watts are you using. Funny out of all the comments on this thread, you are the only one with this problem! Tim, I was using a 75c. I had updated the mod I was using, screwed on a Kanthal Coil and replay would not activate. I then screwed on a SS I had been using that had been showing 3.0-3.1V prior to the update and now was showing 2.7v in Replay. Hi Tim, I loaded 2.2 on my devices, I have replay set up in a Watts Profile, I tried a Kanthal Coil and Replay will not activate, I also noticed a voltage drop in all profiles. I reloaded 2.1 and my devices hit strong again. The amount of total memory vs the amount of that total that has been used. Just Brilliant, you have set the mark to a high level, being copied is high recognition, no doubt your work and design will be copied! @Mjag Howdy MJ, here we are at another great forum, good to see you! Just a perfect UI, love the way you set up Replay. BTW, Replay is the best thing Evolv has ever introduced, just great. Kudos to you Tim for taking the time to develop and make such a great theme! You are welcome! 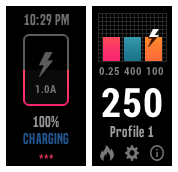 I hate to ask too much of you, but any chance of you fixing the ohm lock in watts on Gauges? Hi Tim, I see 1.2.3 available, but no 1.2.4? Hi Tim, I see that 100W is showing on the VT75D, which firmware version are you using, 26 or 27? I'm using 1.1 = 27 on a VT75D and not able to to get it to work in escribe.